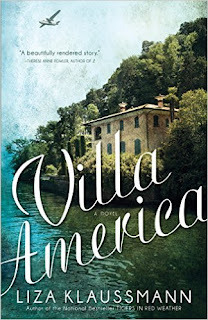 I lucked upon this book in the library -- Villa America by Liza Klaussmann. When I picked it up to read the inside cover, an American couple from New York move their family to the South of France and become part of the elite group of the Hemingways, Fitzgeralds and Picasso. Say no more! I'm in. The sky was as blue as a robin's egg on the afternoon they pulled Owen Chambers's body out of the Baie des Anges. It had taken three days before they could reach him -- spring tides off the coast of Antibes, a lack of proper equipment -- and he was almost unrecognizable when he was finally recovered, seaweed wending its way through his tangled blond hair. I'm definitely intrigued. I hope I enjoy. Looking forward to finding other books that everyone is reading. Since I've been reminiscing about my children's early years, I thought I'd include pictures from Luxembourg Gardens in Paris. If you have children, Luxembourg Gardens are a brilliant place to be visit. There are little sailboats the children float. Pony rides. Carousels with sticks to catch rings on. Puppet shows. 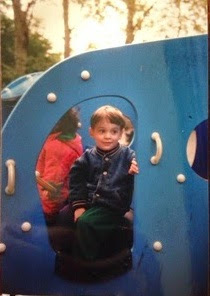 We spent a lot of time in the playground when the kids were little. 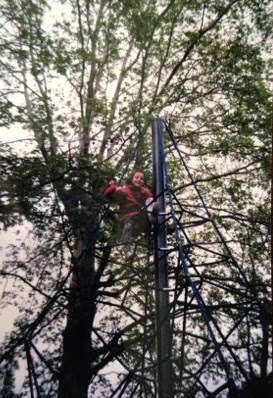 Here's Grace on a climbing apparatus that was kind of spongy ropes. Tucker shared his truck with a cute little French girl. 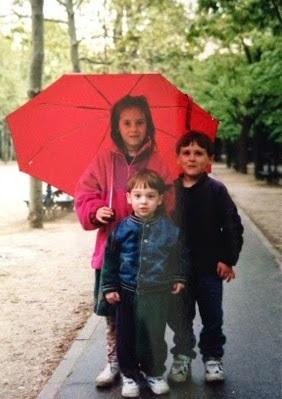 And here are all three of them under an umbrella in Luxembourg Gardens. I hope everyone else has lovely memories of France or dreams of visiting there someday. Thanks for playing along with Dreaming of France. I'm hopeful that more people will begin to join us now that summer is ending. I appreciate your participation and hope that you'll share your love for France with the rest of us. For the past few weeks, I had a machine that scans negatives into my computer. I spent a few days trying to capture my children's photo memories. Some of them turned out well, others had off colors. As I had a chance to review the kids' childhoods, I couldn't help but notice how often we read books. No matter who came to the house, they needed to read books with the kids. Here's a teenage neighborhood boy reading to Grace dressed as a dog. Here's Spencer thrilled with a Castle book. Spencer reading Sleeping Beauty to himself in his toddler bed. Grace and cousin Abby momentarily distracted from their book. Grace reading Thomas the Tank Engine to Spencer. Me reading to Grace and Spencer. Our neighbor Barb reading to Grace and Spencer. I didn't finish scanning photos, so I didn't get to many of Tucker, but I needed to include him, not reading, but getting buried in the sand. The next time I post about my kids, I'm going to show you why would should have known that Grace would be an actress. This week, I spent a lot of time scanning in negatives of photos when the kids were little. Each picture was more adorable than the next. I posted a bunch on Facebook to oohs and ahhs. Today, I planned to post some on my blog, showing how Grace has been an actress since the day she was old enough to choose her own clothes, but instead, I got hijacked by Spencer. Spencer came home from college yesterday, and after eating dinner with us, Earl dropped him off at a friend's house on the campus of Ohio State. This morning, he called and through highly slurred words, asked if I'd pick him up. "Did you sleep at all?" I asked. "No, not yet," he said. So I traveled through the pre-football traffic to pick him up. But when I got there, he had fallen asleep and I had a hard time rousing him. I texted. I phoned. I got out of the car and walked up to what I hoped was the right door. No one answered. As I got in my car to leave, a young man opened the door and he must have woken Spencer because he came out and got in the car. 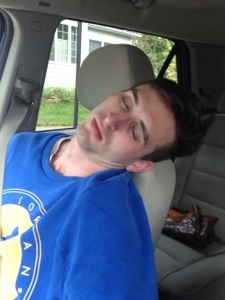 On the 15-minute drive home, he fell asleep. 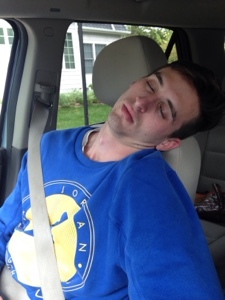 is so darn much cuter than this sleeping, tipsy Spencer at 21? Hope you all have a splendid weekend. My schedule this semester, teaching six college courses, is hectic on some days and totally open on other days. But nature abhors a vacuum, so on Tuesdays and Thursdays when I don't have classes scheduled, when I could use the day to take walks with friends, to write my novels, to grade papers and answer students' questions by email, something usually comes up that requires my attention. 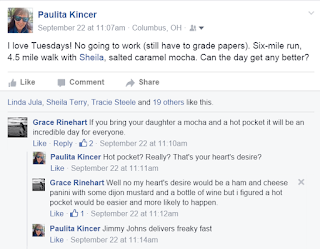 On Tuesday, I made the mistake of posting on Facebook what a fabulous, carefree day I was having. My daughter immediately began to beg me to bring her lunch at her work place. I said no, but she continued to beg, and by that point, my day was ruined anyway. If I went to buy lunch then took it to her, an hour of my day would disappear. If I didn't take it to her, I felt stingy and mean. Wednesday passed in the blur of four classes starting at 8 a.m., a quick gym workout, then a 4-hour evening class. But before I pulled myself out of bed at 5:45 this morning, I already knew that the day had filled with errands, the biggest one being a drive down to Athens, Ohio, where my boys go to college. The drive is beautiful, but I'm not going to enjoy it or even to spend time with the boys. Instead, I'm driving down, picking up the car that needs a brake job and driving back. Yes, my family is sending me after the car with the faulty brakes. So a three-hour drive for me this morning followed by an afternoon of grading papers. Hope you get some time to enjoy yourself today. France and sunshine. 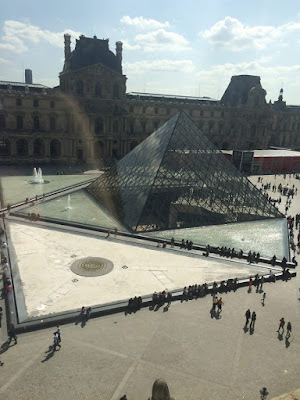 That's enough to win me, but when you add in the architecture of the Louvre pyramid, and the artwork underneath, well, it's just about perfect. 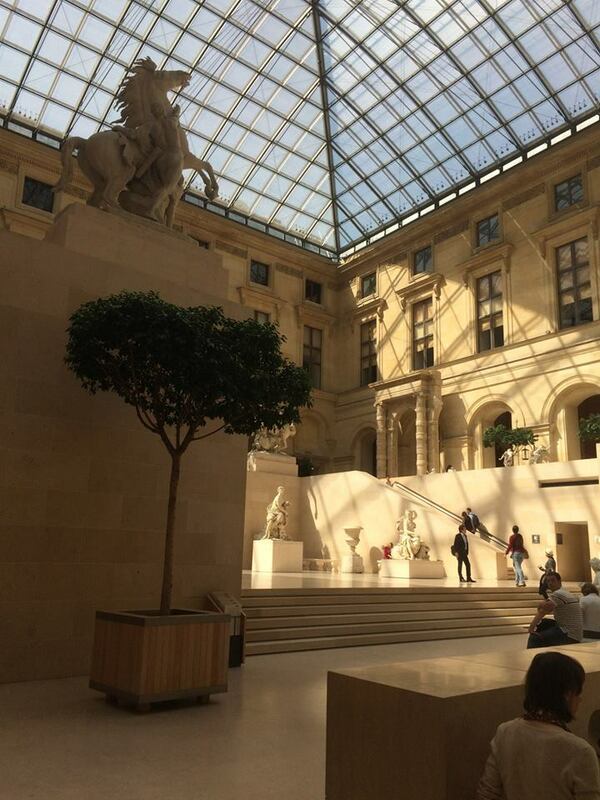 The shadows on this one make it interesting as people enter the amazing Louvre. Here's one out the window, the slightly smeary window. All day I have longed for France, how bout you? 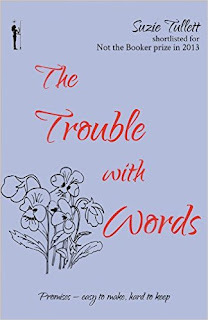 I'm starting a new novel by my author friend Suzie Tullett. She's written a novel set in France since she recently moved there. What a life she has! She used to live in Greece and wrote a novel set there. The book is available for pre-order now and comes out in the beginning of October. Annabel checked her watch and groaned. She'd always had a problem with punctuality. No matter how hard she tried, how early she left the house, or even how fast she drove, she always seemed to be running late -- a reality that had only gotten worse over the last couple of years. Despite these good intentions, it seemed even days like today weren't enough to get her act together. Then again was it any wonder? As she was lost in her own thoughts most of the time, minutes often turned into hours without her even realising it. The book features Annabel, a young widow, who is determined to have a baby and searching for the right man to provide what she needs. Here's the link to the book on Amazon if you want to know more. 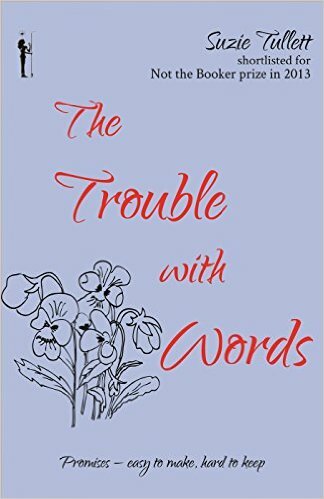 The Trouble With Words. I'll be doing a full review of the book in early October, so watch for it. We first visited Monet's Garden in 1998. 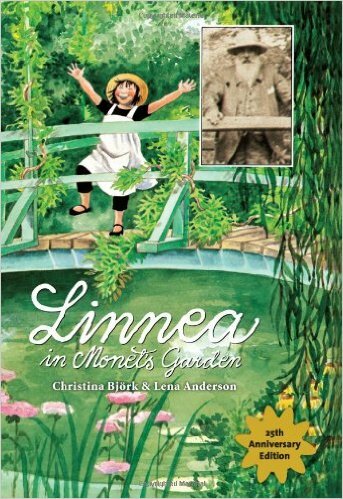 We learned about it from a children's book, Linnea in Monet's Garden, which features a little girl from Sweden who visits Paris to see the gardens of the famous artist. We were staying with a French friend, Marguerite, in Paris when we said we wanted to visit Monet's Garden. She had never heard of it, so she came along with us. Here we are on the lovely bridge that Monet painted so often. Marguerite is in the red coat, dressed for winter as the French do right up until summer erupts. I'm holding Tucker, who was 2. Spencer was 4 and Grace 6. Here's a shot of the pond and the gorgeous weeping willows. Here's a show of Monet's pink house with the green shutters from the gardens. I'm not sure if this cat was in the window at Monet's house or elsewhere in France, but the stucco wall and the green window trim with the lace curtains make me think it was Monet's house. 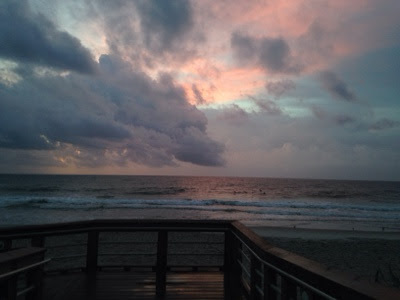 Spending a few days on the oceanfront provides lots of photo opportunities. Here's a sunrise as I ran along the beach one morning. The evening before we left, we went for a walk on the beach and I took some pictures of Grace. I love that the seagull placed himself in the negative space of this picture to help balance it. And here is Grace drinking in the beauty of the ocean while the sun sets behind us in the west. 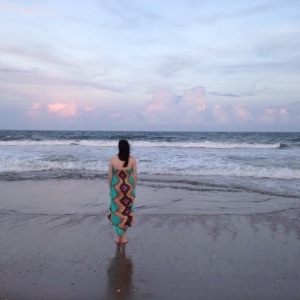 This past weekend, Grace and I drove to North Carolina and spent three nights in a hotel along the beach. 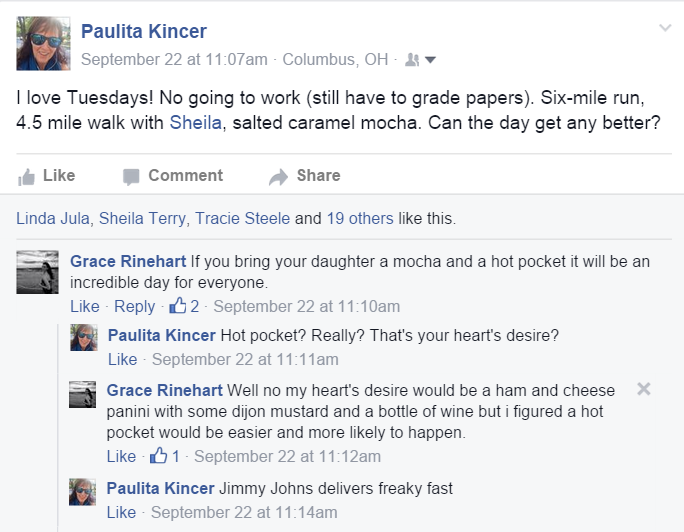 Grace is starting a new job this week and I had an extra day added to the three-day Labor Day weekend. My goal was to try paddle boarding, and I did. I made reservations for 9 a.m. Sunday. 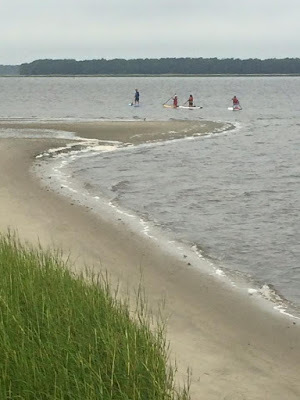 The paddle boarding was at a nearby state park on Cape Fear River rather than on the Atlantic Ocean. Judging from the waves on the ocean, that was a good thing. I didn't ask, but I assumed the lesson was about an hour. Throughout the night, lightning flashed outside our window and thunder rumbled. The weather app on my phone predicted thunderstorms throughout the day. I feared my paddle boarding lesson would be canceled. Since Grace was awake, I asked her to come with me. She could take some pictures from the shore. Three of us showed up for the lessons -- me and a couple from South Carolina who had tried paddle boarding before on a quarry. We put on life jackets and attached the board to our ankles with a leash. We started out kneeling on the boards as we pushed off from the shore. I had a wide yellow board with some black rubber padding in the center where I would stand. I wobbled a bit on the board as everyone moved into the river. We waited until we were all together to try standing up. 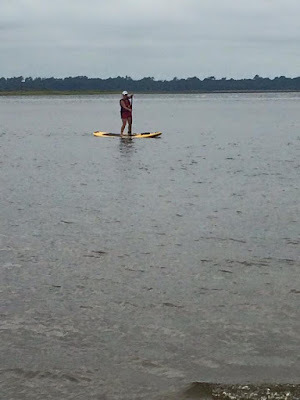 I feared I wouldn't be able to stand up, but I followed instructions, laying my paddle perpendicular to the board, putting up one foot then the other and moving to stand from a crouching position. "And remember to look straight ahead, not down," the instructor said. And it worked. I was standing and paddling, although unsteady. Plus I had a shoe problem. We needed to wear shoes because the bottom of the river from where we set off had sharp oyster shells. I wore a pair of maryjane crocs, and when I brought my feet forward, they kind of slipped part way off my feet, so some of my toes were in the shoe and some were sticking out. It was quite uncomfortable. Behind me, I heard a splash. The one man taking lessons fell in as he attempted to stand. Throughout the lesson, he probably fell in half a dozen times. As we paddled toward an alcove where the water and wind were calmer, the instructor, Bill, and I chatted. I told him I'd been afraid that I wouldn't be able to stand up. "Was that your biggest fear?" he asked. "No," I said. "I'm nervous about getting back on the board if I fall." My son Spencer, who has an impressive set of muscles and upper-body strength, told me that it's hard to get back on the board. If he had a hard time, I'd be doomed. Just as I voiced these fears, I wobbled and fell. "Fall away from the board," Bill called as I slammed straight onto the board and then rolled off the side into the murky river. "Just throw your body over the center of the board," Bill said. And I tried, but something kept me from moving farther. The life jacket had a clip on it, like a clothespin, caught on the handle of the board. It took me a few maneuvers to get that free before I could pull myself onto the board, then pivot so I lay flat on the board. Next I moved to kneel on the board. I removed my shoes this time and pinned them under some bungee cords at the front of the board. I had done it. I'd fallen in and been able to get back up.Proudly, I can tell you that is the only time I fell. The lesson continued as Bill showed us how to do turns. we ended up paddling to a cove off the river where the water is about 45-feet deep because they dredge sand from there. We paddled into shore and took a break. Might feet were tired from standing on them for 50 minutes straight without shifting. 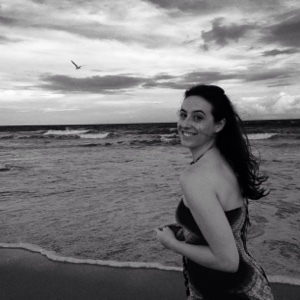 It felt good to walk around on the sand, to stand on my tiptoes, then my heels. That's when Bill told me the lesson lasted two hours. I felt bad thinking of Grace back in the parking lot waiting for me. But she had a magazine and a book and a coffee, plus I couldn't do anything about it. At 9:50 a.m., we began the trip back to the marina. The trip down the river had been effortless. The river ran that direction and the wind was at our back. The return trip was brutal. The wind picked up and whistled sharply past my ears as I paddled endlessly for an hour and a half. Everyone else seemed to be able to move much more quickly than I did. My board was different, so maybe I had the equivalent of a mountain bike while everyone else had road bikes. Or maybe my paddling was as efficient as everyone else's. I soon fell behind. Bill would hang back occasionally to wait for me. I tried to watch the others and keep up stroke wise, but my paddling didn't move me forward as quickly. The other guy fell off his board a couple of times and got back on but I still didn't catch up with him. Here's a video Grace took. At the end, you can tell as she pans over to the marina, that she didn't have high hopes I would get there either. At 11:30, I finally reached land. My feet felt numb and my palms were bright red with blisters forming along my pointer finger and thumb where I'd paddled. Somewhere, during that two and a half hour jaunt, I felt a familiar sensation of wanting to be finished. I recognized it from the long runs I'd done, or even the overzealous bike rides. Hot, sweaty, ready to be finished. To add to the misery, I'd been on a juice fast and had eaten no solid food for two weeks. My body had no reserves to pull from. I made sure to eat some protein that day, trying to stock up on what had been depleted in the two and half hour exercise. I'll definitely try paddleboarding again. I can see how it can be a beautiful, contemplative experience, especially if I was by myself and could determine how far I went and how long I paddled. Being with a group and feeling like I held the group back made the experience not as fun. And the trip itself was too much for the first time. Alone though, I might have more fully appreciated the elegant white egret stalking its prey in the shallow waters; the gray waters flowing below me; the occasional fisherman throwing out a net to pull in bait fish; and the search for frolicking gray/black fins of dolphins that venture up the river. I'll definitely try again, on my own time. 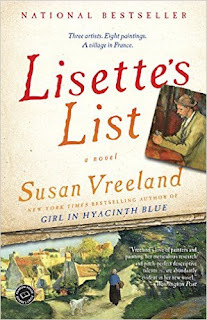 This week I hope to start Lisette's List by Susan Vreeland. You may know her from the novel The Girl in Hyacinth Blue. Amid the crowd of travelers darting in front of the Avignon train station, the delivery boys on ancient bicycles swerving between children and horse carts, and the automobile drivers honking their horns. Andre stood relaxed, eating an apple from a fruit stand. Meanwhile, I paced in a tight circle around our carpetbags, our valises, and our crates filled with everything we could take with us from our apartment in Paris, plus the tools from his workshop, plus the dream of my life sacrificed. "Are you sure we're in the right place?" I asked. "Yes, Lisette," Andre plucked a broad leaf off a nearby plane tree and laid it on a cobblestone. He touched my nose with his index finger and then pointed to the leaf. "He'll park right there. On that cobblestone. Just watch." He squeezed my hand. "In the south of France, things happen as they should." 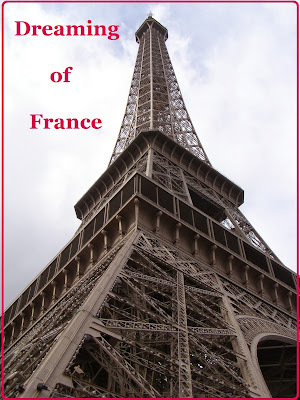 Oh, did I mention that it is set in France? Another attraction for me. 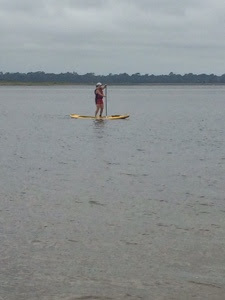 Today, I went paddle boarding on the Cape Fear River in North Carolina. 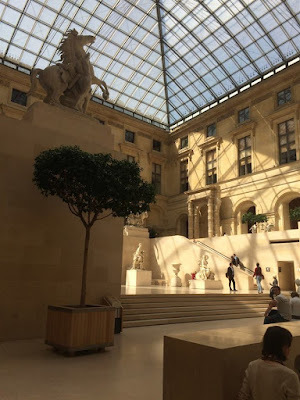 You might be scratching your head about how this relates to Dreaming of France, but I realized that I've accomplished all of the things on my Dream List, except for moving to France. We found out this week that Earl is keeping his job at the newspaper, so our plans to sell our house and take off for France have been put on hold for a while. I wrote about these worries earlier this summer in the post France Dreams Coming True. Knowing my husband will keep his job is a good thing. We're more in charge of our destiny now since we get to decide when we move to France rather than moving because of a job loss. We still plan to take our next adventure, but we are putting it off probably until next autumn. That will give us the chance to get a second kid through college. With that in mind, we hope to visit France for the month of May next year to visit different areas and determine where we want to live. 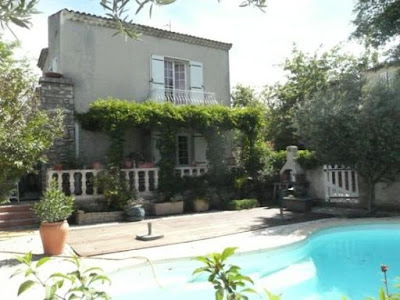 Maybe we'll end up with a house like thin in the Vaucluse, near Provence. I hope everyone else's dreams of France are coming true, and I do plan to update my dream list so that I can keep having new experiences. Hey there folks! 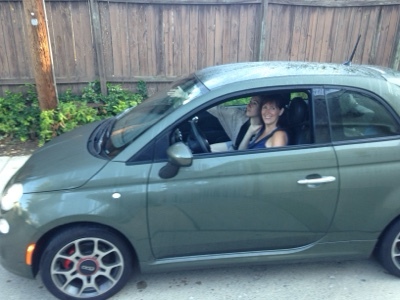 This is Grace guest blogging while Mom is in charge of driving Paolo the Fiat through West Virginia. 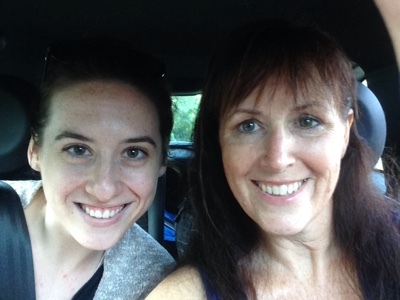 We're traveling to North Carolina today so we figured we'd take you along with us on our fabulous adventures. 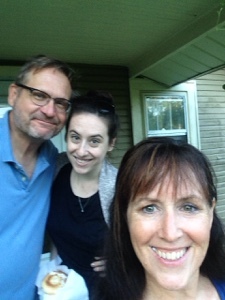 Dad helped us pack up the car, probably eager to see us go so he could watch tv that doesn't involve a wedding plot or fashion. 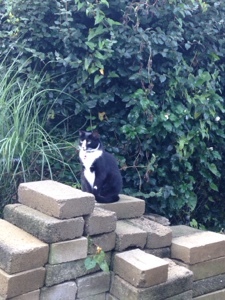 Tupi the cat was in charge of all preliminary checks on the stone blocks by the garage. It didn't actually have anything to do with the trip but he felt the need to do it anyway. We're looking and feeling awesome!! Can't wait for a long weekend full of beachy fun. And we're off! We'll post some new updates once we're sure Paolo can make it through the mountains. 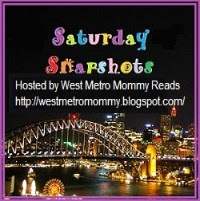 Click on the picture above to go to the blog tour info. 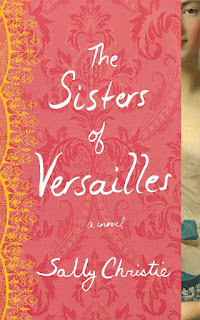 Today I'm reviewing The Sisters of Versailles by Sally Christie for FranceBookTours. 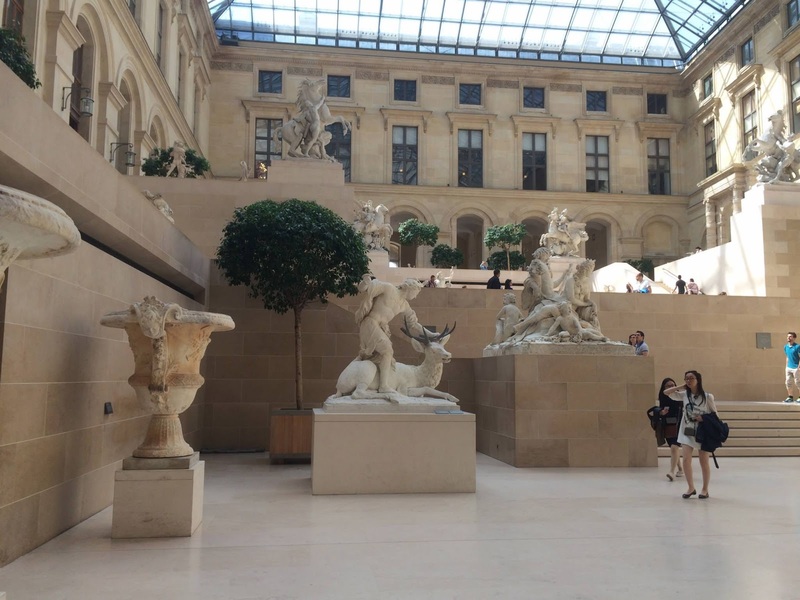 Everyone knows about the Palace of Versailles and its sumptuousness, so setting a novel there insured that the reader would be steeped in French history. Some might expect a novel set in Versailles would focus on the Sun King, Louis IV, but this one centers on the time of Louis XV in the 18th century, and it's based on a true story about four of five sisters who became mistresses of the king. The five sisters take turns telling their stories. At the beginning, I worried as each sister told a similar story, but as the pages turned, their language became more individualized and in-depth. They quickly moved from their childhood nursery to marriage and to Versailles where more adventures began. The music stops, and suddenly the meaning of this meeting becomes clear. "You wish my help in finding the king a mistress?" I say, looking between the two charmers. Fleury looks at Charolais, who makes a small grimace, as if to say, I told you so. She turns back to me with a dazzling smile. "You are very perceptive, dear Louise. As always. It is true in a way that we wish you help, and who better to help us than the one we wish would help us the most?" I am not sure I understand. At Versailles in such situations, it is always best to remain silent. Fleury steps in: "I think we need to talk plainly, and simply. Clearly, Louise, we think you should be the king's mistress. For the king, and for France." Louise is an innocent and falls in love with the king, but some of her sisters have other motives as they weasel their way into the bed of the king. The novel definitely kept me reading and I'd recommend it to anyone who enjoys France or historical novels. Make sure you scroll down to the bottom of the post to get a chance to win a copy of the novel. Court intriguers are beginning to sense that young King Louis XV, after seven years of marriage, is tiring of his Polish wife. The race is on to find a mistress for the royal bed as various factions put their best feet—and women—forward. The King’s scheming ministers push Louise, the eldest of the aristocratic Nesle sisters, into the arms of the King. Over the following decade, she and her sisters—ambitious Pauline; complacent Diane, and cunning Marie Anne—will conspire, betray, suffer, and triumph in a desperate fight for both love and power. The Sisters of Versailles is a treat through and through – the characters are witty and engaging and come together to create an undeniable page-turner. Sally Christie has a wonderful sense of pace and the book unfolds in front of you like a delicious gift. Even as the scandals pile up and the intrigue mounts, you can’t help but fall in love with these sisters and their competing infatuations with the King. attending eight schools in three languages. and is currently settled in Toronto. —she’d be off to the eighteenth century in a flash! 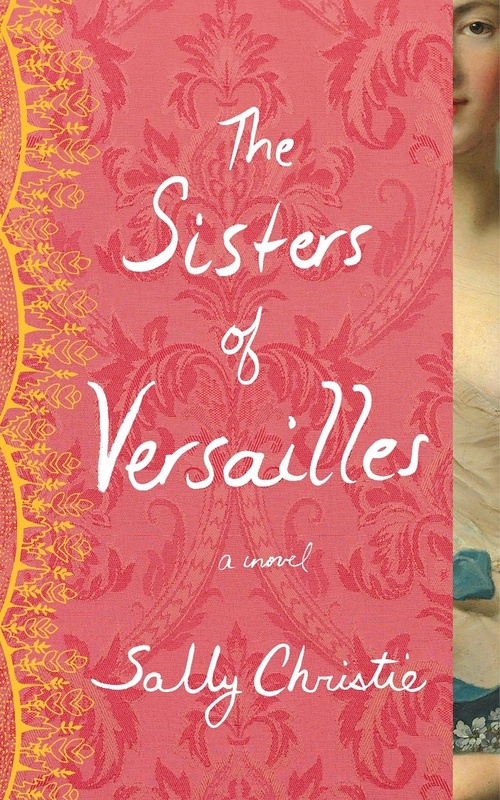 The Sisters of Versailles is her first novel. 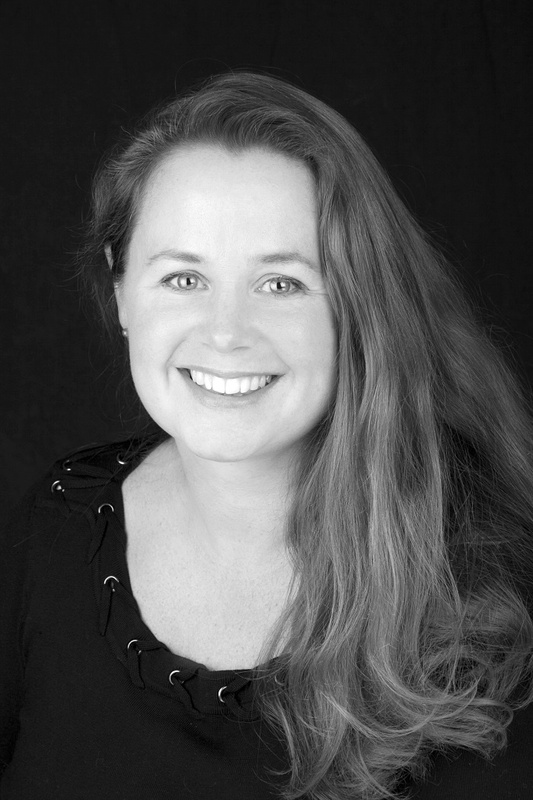 Learn more about the sisters and the mistresses in the Versailles trilogy on her websiteBecome a fan to hear about her next novels! You can enter to win a copy of the novel at the entry form below.